I seem to have caught some kind of bug from the trekking holiday I took last week. The doctor has given me antibiotics and told me to take it easy, so I hope to get more time to blog! 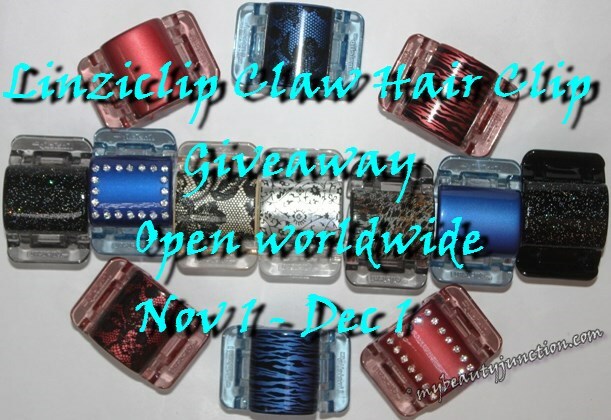 Yesterday, I had reviewed the Linziclip claw hair clips and shared some of their gorgeous designs. Today, I am delighted to announce a giveaway of Linziclips, open worldwide, to three winners, thanks to the generosity of the Linshell Group. The photograph above is for illustrative purposes only and may not depict the Linziclips that the winners will receive. If you have not heard of the Linziclips yet, do click here to read my feature straightaway. These are revolutionary improvements on the traditional butterfly clips, and do not dig into your head even when you lean back. And, because the springs are hidden, hair does not get caught in the clips. They come in three sizes, Maxi, Midi and Mini. More details, including where to purchase, are in my feature. Scroll down for a chance to win some gorgeous Linziclips. Winners can choose their style (choose from Winter or Summer only, NOT individual patterns), and sizes (from Maxi, Midi or Mini). So if you want Maxi clips in Winter style, or Midi clips in Summer style and so on, you can let me know, when you send me the winners' details! Those with short hair need not feel left out, the Mini Linziclips are ideal for jazzing up your hair! The photograph above is only for illustrative purposes and may not depict the Linziclips the winners receive. Click here to go to Linziclip's Facebook page, where you can see the latest selections and to get updates from them. Now for the rules of the giveaway. This giveaway is open worldwide, and will run until December 1. The Linshell Group has sponsored the prizes and will ship them to the winners. I only host and facilitate. Neither the Linshell Group nor I will be responsible for customs duties, local taxes, import charges, excise or any surcharges incurred by the winners. Neither the Linshell Group nor I will be responsible for packages lost or damaged in the post. Winners may choose the size and the "season" of the clips they wish to receive - patterns of the individual clips are decided by the Linshell Group. The photograph at the beginning of this post is only for illustrative purposes and may not depict the Linziclips the winners eventually receive. I will be announcing the winners sometime within a week after the giveaway ends (you know my schedule is crazy). Winners must email me their shipping addresses and clip choices within 48 hours. Please follow the mandatory entry requirements as specified on the Rafflecopter widget below. Your comments about your favourite hair clip and/or style may be used on this blog or by Linziclip later for survey purposes. You can subscribe to my email newsletter by entering your email address in the bar above the header (I do not spam or disclose your email IDs elsewhere). I have been redoing my blog, so the subscribe widget has gone from the sidebar. Disclosure: The prizes of this giveaway are sponsored by The Linshell Group. I have not received any compensation for hosting this giveaway. The photographs used in this post are for illustrative purposes only and may depict press samples sent for editorial consideration.